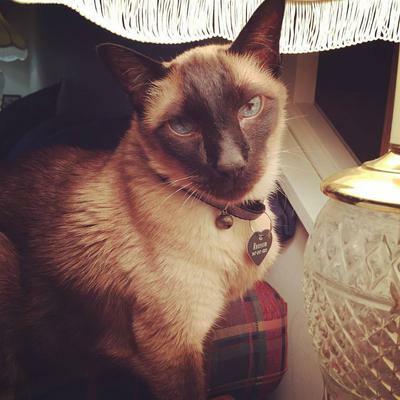 Today we said goodbye to our senior Siamese, Ransom. Although all cats are unique, with their special personalities and ways, Ransom was distinctly individual. He joined our family somewhere around 2002, when a good friend called me one day, offering me a Siamese kitten. Turns out she was allergic to him. I went to meet the kitten, and of course, brought him home. We named him Ransom after the main character in C.S. Lewis’ Space Trilogy. He was very beautiful, a seal point Siamese, and extremely playful. Also very cuddly. My friend explained to me that he had been boarded in an animal hospital for over a month before she adopted him, and he was used to being carried around by the workers there, so he was bonded to people and did not seem to know that he was a cat. We realized this almost immediately, as he did not bond with our other cats and only wanted to twine himself around my husband’s or my neck. When we picked him up, he would extend his forelegs out, like a little child waiting to be picked up and held! But he was very aggressive with the other two cats (Otis and Lucy) and chased them away when they tried to lay down by him. After a while they gave up and Ransom remained a “loner” in our cat family. In addition to this, he was a biter, and that was a quality I really struggled with. Sometimes he made me mad and I just didn’t like him! When visitors were over and admiring our cats, we had to warn them away from Ransom, for fear that he would bite. But my husband, Reed, who is a counselor (among other things!) took on the project of Ransom – he seemed to have a special knack and patience for him and over time, although Ransom continued to be a loner around the other two cats, he settled down somewhat, biting less, and staying by my husband’s side – he became Reed’s cat. When our Tonkinese, Otis, died in 2007, our Lucy, a petite seal point girl, was depressed and devastated. Our hope was that in the loss of her companion, she would turn to Ransom, and he would finally start acting like a cat and bonding with her. No such luck. So Lucy ended her days bonding even more deeply with me (I worked from home and she was always at my side). So we settled into having one “loner” cat, and another “lonely” cat, both seeking solace in their respective humans. In early 2015 I said goodbye to my beloved Lucy, after 15 years of loving companionship. Oddly enough, in my grief, I found Ransom to be very sweet, coming up to me, hopping onto my lap, putting his paws around my neck and purring into my ear, cheek to cheek. This was new behavior, as he’d always been close to Reed, but not me so much (our history was conflicted because of his biting). I saw a new side of Ransom and I think he really liked being the “only” cat in the house. Then in the summer of 2015, several months after we lost Lucy, I brought home a new Siamese kitten named Jazzmin. What fun! Ransom did not quite know what to make of this and tried to swat her away, but she was persistent, leaping on his back and coming back again and again, even when he growled, hissed and swatted her. One day we found them sleeping together, and soon they were a real item, sleeping together and grooming each other. In his old age, Ransom finally found a feline companion and began to be more catlike than he ever had! In July we brought home Ziva, another kitten (a blue point). Ransom was sweet to her and did not seem to mind her climbing on him and swatting his tail. But this last year of life has been very tough on Ransom… we learned that he had a collapsed lobe in one of his lungs, and a digestive disease that was causing muscle atrophy. He had a hard time keeping his food down. The vet put him on a regimen of special diet and 4 pills daily. For about six months he seemed to be feeling better and we felt the treatment was working. But in the past two months, he began to decline, eating very little and becoming more and more listless. He continued to stay close to Reed and enjoyed the company of Jazzmin, but we could see that things were rapidly going downhill. He would stay in bed all day, eating very little and we could see him fading away. So today we said goodbye and Reed took him to the vet to end his suffering. This was a very sad day for us, especially Reed. Our misfit cat finally came into his own as a cat, bonding with our current cat family and enjoying all the benefits of warm fur and mutual grooming. It was wonderful to see this happen, and it makes us happy to think that in the last year of his life, he finally learned how to be a cat, with other cats. And we will all miss him. Donna, thank you so much for sharing Ransom's story, and I'm so sorry for your loss. 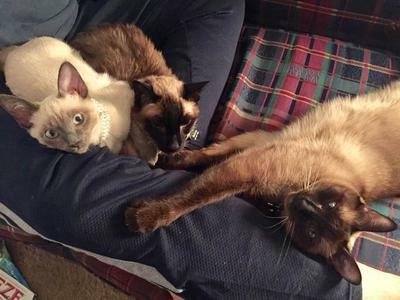 Ransom sounded like a very individual, independent kind of a cat as many Siamese are, and it's good to know that in later life he was able to bond with Jazzmin and then Ziva and share the love of a feline family as well as human one. He was a very handsome cat. I've enjoyed reading about the other cats you've shared your lives with over the years too - Siamese cats are all so different with their own characters and foibles! I've learned something today too. I'd never heard of C.S. Lewis' Space Trilogy, although I'm familiar with his other work and especially the Narnia stories. I must read the Space Trilogy now and will of course think of Ransom when I do.